UK based Tranquil PC have been in contact with us to announce their latest offering, the SQA-5H Home Server. 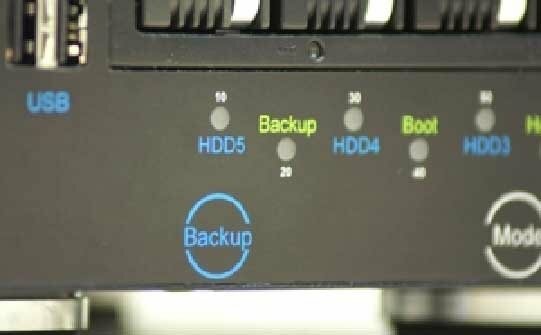 The multi-drive server comes with the latest 64 bit ready Intel Atom Dual Core processor (Intel Atom 330 – 2×1.6GHz) and 1GB of memory (upgradable to 2GB) and supports five quick install 3.5” HDDs, 6 USB HDD ports, and an eSATA port, and if that is not enough, you can plug in the SQA-Ex, a slave unit – with a further five HDD bays. The SQA-5H offers ultra low power consumption (as little as 29W), a simple to use ‘back up now’ button and comes complete with a 3 year factory warranty. The wife friendly cube design is near silent in operation due to The CPU and chipset being cooled without fans, whilst the HDD bay, is cooled by a slow speed controlled fan. Available in 2 versions, the entry level SQA-5H-1000 Home Server comes fitted with 1GB memory and a single 500GB Green Power Hard disk for £399 ($692) whilst the performance based SQA-5H-2000 Home Server is fitted with 2GB memory and a single 1TB Green Power Hard disk for £499 ($865). 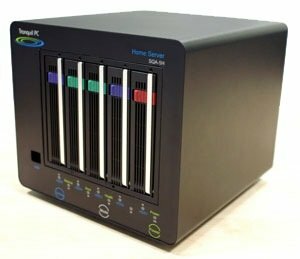 Also available is the SQA-Ex HDD extender which gives you an extra 5 HDD bays for £429 ($744), whilst a carrier for the SQA-5H HDDs is available for £44 ($76)each. (All prices excluding UK VAT at 17.5%) To get 5% discount on your order (time limited offer) enter the following coupon code at checkout WGS-5WA12. More information is available from Tranquil PC. These units look nice, and I’m especially interested in their SQA-Ex HDD extender. However, when I visited their website, the information that they provided for their products were … pathetic, at best, with only a single small picture of this item. How can they expect for people to seriously consider purchasing their products if they can’t be bothered to give better descriptions? Or is it that they’re trying to hide something (or trying to hide the lack of things)? 3. No mention of the hard drive cooling. I’ve spent many hundreds of dollars on each of the 4 multi-HDD cases I’ve purchased in the past, whereby those items were claimed by the manufacturers to provide cooling for the drives, but in reality the cooling was non-existent. Those items are purchased by us WHS users to house our hard drives, which contain ALL of our important data, pictures, etc., so the hard drives need to be well-protected, of which cooling is a big part. All that Tranquil does mention is that single 80-mm fan, which would be on the rear panel. But I wonder as to how much (if anything at all) that fan would be able to cool the hard drives? The hard drive carriers themeselves don’t have any cooling fans built in. 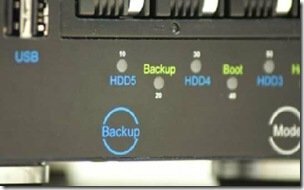 I would be interested to hear from users, once they purchase & receive their HDD extenders, as to how hot their installed hard drives actually get. Very impressive products all round. High quality, great integration with SONOS, Linn, Squeezebox etc. Tranquil AVA RS3 is very popular now in the USA and Canada via http://www.ripstyles.com. I just hope you never have a problem with yours as support from tranquil pc is non existant and to get more than 1 reply on the same day to your support question with out it being a question then wait another day for a reply. 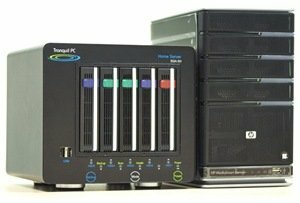 Only buy from tranquil pc if you are prepaired to wait at least 3 days before you get anyware with support. It looks like they only look at support tickets in a morning so dont hold your breath.